WHY IS JOSEPH PITRUZZELLI, A DOCUMENTED LIAR AND A HYPOCRITE STILL LARABA'S PRESIDENT? The Los Angeles River Artist Business Association is purposely turning a blind eye to their own president's blatant hypocrisy since his arrival in the Los Angeles Arts District. Joseph Pitruzzelli is a blatant hypocrite and must go as LARABA's president. Joseph Pitruzzelli has had no regard or respect for his artist neighbors since his business's rude arrival where he was cited by the city of Los Angeles for the illegal use of an Artist in Residence as a commercial warehouse in the heart of the LA Arts District. A use that has actually driven artists out of the Los Angeles Arts District itself, and the fact that Joseph Pitruzzelli's disruptive and illegal use continues still to date. This is blatant hypocrisy and a slap in the face of the actual artist in the Los Angeles Arts District. Joseph Pitruzzelli must go as the president of the Los Angeles River Artist Association. LARABA can not continue to turn a blind eye to their own president's hypocritical actions. I was the artist that lived in the Los Angeles Arts District for 30 years and was unfortunately next door to Joseph Pitruzzelli's business, Wurstkuche Restaurant when they arrived in 2009. Joseph Pitruzzelli leased the AIR loft next to my studio and began to illegally use it as a commercial warehouse for his restaurant next door. I sued Joseph Pitruzzelli for that illegal commercial use of an Artist in Residence and I won. But Joseph Pitruzzelli refused to stop his commercial use of that legal Artist's loft. He turned it into a 24 hour nightmare for any artist actually trying to live and work there. Joseph Pitruzzelli would not stop his illegal use and had the case appealed because I sued him personally and didn't sue him as his republican corporation, Wilson, Pitruzzelli Investments, LLC. 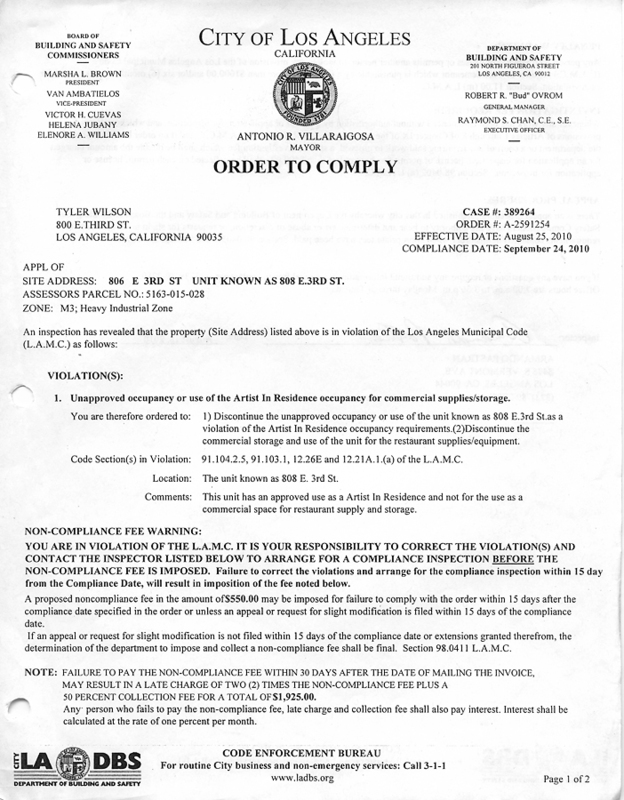 The city of Los Angeles cited Joseph Pitruzzelli's business for the illegal use of that AIR loft as well as Paul Solomon, the owner of my building. But rather then do the right thing and be the least bit considerate to his artist neighbors, Joseph Pitruzzelli refused to stop his illegal use, at which point I was forced to fight my landlord who was also cited by The City of Los Angeles for Joseph Pitruzzelli's illegal use of that legal AIR loft next to me as a 24 hour noisy commercial nightmare. That was my home and my studio for year before Joseph Pitruzzelli showed up and disrupted the arts district with no regard what so ever for the actual artist trying to live and work there. Having Joseph Pitruzzelli as LARABA's president is total hypocrisy. I ended up leaving the arts district because of this on going and growing nightmare Joseph Pitruzzelli and his partner Tyler Wilson brought to the Los Angeles Arts District. And his illegal commercial use of that loft in the heart of the LA Arts District continues to this day. Joseph Pitruzzelli's business has no permits to use that loft commercially. But he still does not care because he has chased the artist around him away. This man should not be the president of any artist association. LARABA must fire Joseph Pitruzzelli. Hypocrisy is not leadership. 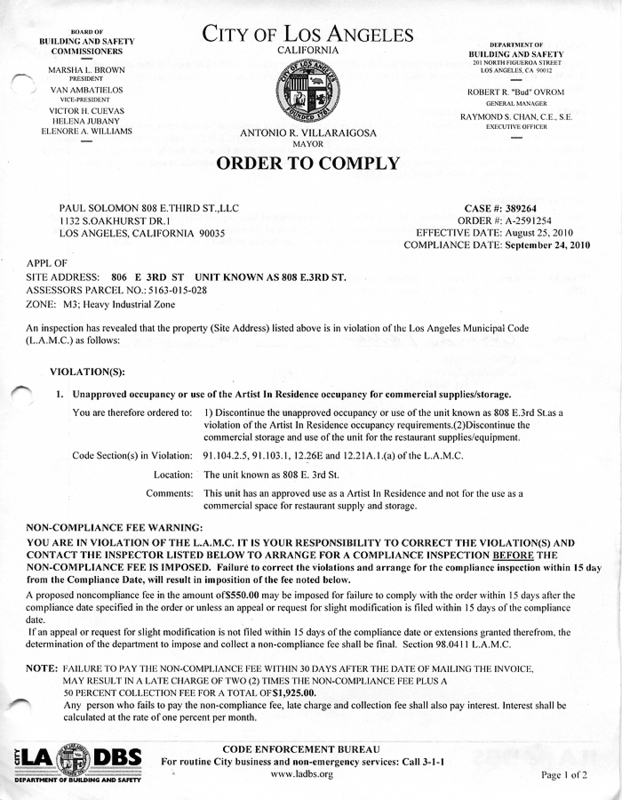 Paul Solomon and the owners of Wurstkuche, Tyler Wilson & Joseph Pitruzzelli were cited by the city of Los Angeles for there illegal use of an Artist In Residence loft as a noisy 24 hour commercial warehouse for Wurstkuche Restaurant next door. 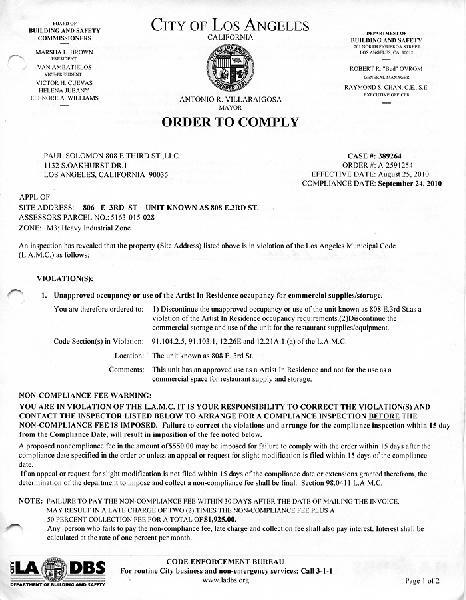 Joseph Pitruzzelli refused to comply and continued his 24 hour disruptive and illegal use of that legal artist loft even after being sued by the artist next door. That is LARABA's current president. No integrity. No conscience or respect for his artist neighbors. Joseph Pitruzzelli must go as LARABA's president.